Hilarious conversation after a mistaken addition to WhatsApp group chat. 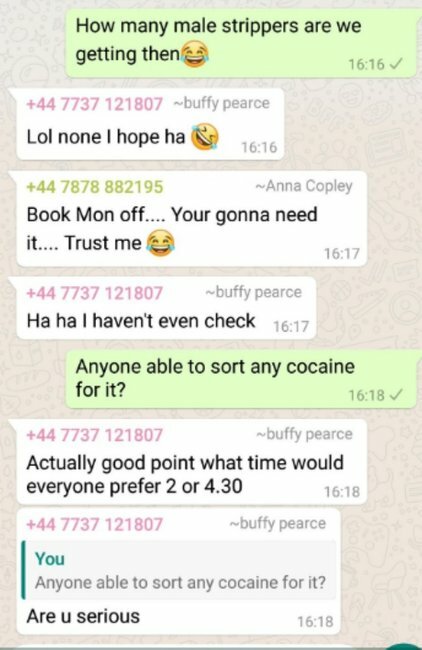 Billy found himself in a group chat with women planning a 50th. Their exchange was gold. A 23-year-old plumber thought he’d have some fun when he was mistakenly added to a group chat planning a woman’s 50th birthday. Billy Rawlinson, from Devon, England was accidentally added to a WhatsApp group named “Sandra’s 5oth”. Instead of correcting the group of ladies planning the party, who thought he was their friend Lorraine, he decided to play a prank. The women laughed off what they thought was their friend’s joke, one writing “none I hope”. But Billy’s next party suggestion wasn’t so well-received. “Anyone able to sort any cocaine for it?” he asked. One of the women asked him if he was serious, to which he replied: "Yes, why not?" And then Billy got a response he probably wasn&apos;t expecting. "Because it’s illegal I’m a police officer as well," the woman said. Unfortunately, we don&apos;t know if the conversation continued or Billy decided to come clean at that point. The screenshots of the exchange the man posted to Twitter end after that comment. The tweet was soon shared and liked by more than 100,000 people - eventually reaching the birthday girl herself, Sandra. "What a lucky boy you was to be invited to the event of the year," she joked in a reply to his tweet. She also suggested that with "all these retweets" she should be in for some extra presents. "Anyway made us oldies chuckle all afternoon," she told Billy, who was glad she could see the "funny side".